The MyInventory page shows you everything that's currently in stock. It's also the main interface for performing inventory transactions. You can add inventory; increase, decrease, or move items; convert units of measure; apply serial numbers, expiration dates, lot numbers, or other custom data; view recent transactions; undo transactions; show images; export data to a spreadsheet; and more. Adding new inventory and new items is easy. Simply click the "Add Inventory" button and you can create item IDs, locations, and units of measure; enter cost data; and enter other custom transaction and item data that you specify, all from the same form. Search your entire current inventory at once. Use a keyboard or barcode scanner to populate the search field and instantly search your current inventory for any value entered in the field. You can also search against filtered versions of your current inventory (see #4). Powerful filter controls make it quick and easy to filter your current inventory in many different ways. And just as important, the filter type is always visible, so you know whether you're filtering for exact matches, approximate matches, date ranges, or relative numeric values (equal to, less than, greater than, etc.). We make filtering quick and easy to eliminate the frustration of searching your inventory. You can display images of your items right on the MyInventory page. Or, if you want a more compact view, don't display the images. Displaying product images can make scanning inventory records easier and help reduce errors. If people can see what they're dealing with, instead of just a SKU or UPC code, they are much more likely to work with the right product and less likely to make mistakes. 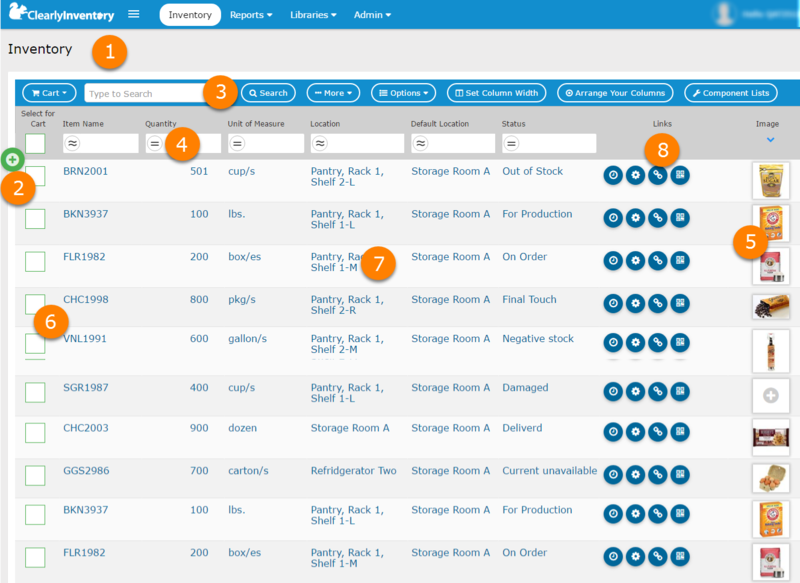 The "Action Qty" field allows you to perform any inventory activity, all from the same control. Simply enter the quantity you're going to act on and choose from: Increasing or Decreasing the amount of stock, Moving stock from one location to another, Converting Units of Measure (for example, from "cases" to "ea. "), Updating the status (for example, to reserve sold items), and Applying unit data (things like serial numbers, expiration dates, lot numbers, etc.). Our exclusive (as far as we know) "Click to Filter" technology allows you to easily filter your inventory data by simply clicking any piece of data displayed in the table. This is extremely helpful when you want to quickly view all items in your inventory with a common characteristic, for example, all items that are sold or have the same color, size, or expiration date. With "Click to Filter", your life just got a whole lot easier (as if that were even possible!). The MyInventory table doesn't just allow you to display data, view images, and perform transactions, it also allows you to jump to the item master (the little gear button) or view the inventory history for a given record (the little clock button). And about that little clock button—it not only lets you view everything that's happened in that inventory record, it also allows you to "Undo" any mistakes you've made in the past.